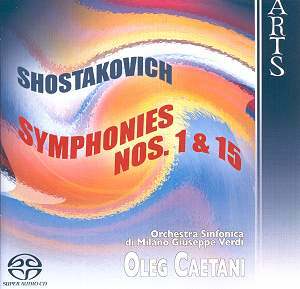 The coupling of the first and last Shostakovich symphonies works very well. This is a substantial improvement over Caetani�s Nos. 5 and 6 (review), a disc that ultimately left me cold. But still there are too many caveats to allow for straightforward recommendation, not least a resonant acoustic that seeks to undermine the characteristic edge that lies at the heart of Shostakovich�s music. The First Symphony reminds one, on each hearing, of the composer�s achievement. A graduation exercise set by his teacher Maximilian Steinberg, this is clearly the work of a genius composer, not least in the long, almost Mahlerian Lento. Caetani tries to make this Lento a dramatic journey and in doing so makes it the most successful movement of his performance - lovely oboe solo, a real ray of light, by the way. It is the commedia dell�arte aspect of the first movement that is missed due to a certain literalism. Perhaps Caetani�s ideas are elsewhere � he seems intent on suggesting Ives at around 4:30, and does so in a very thought-provoking way. The dynamic range of the recording is certainly impressive in the finale; you have been warned. So impressive, in fact, that the applause that greets the performance seems remarkably feeble. The Fifteenth Symphony is full of questions. The Milan players rise to the challenge. The flautist at the opening is nicely on his/her toes, launching an action-filled movement that is active, shifting, spooky and cheeky all at the same time. Caetani tries to squeeze every ounce of emotion out of the Adagio - labelled Allegretto on the box - helped by a well-balanced brass section and an excellent solo cellist. Curiously, the cellist is unnamed yet the solo violinists in both symphonies are credited, and neither is of the same standard! It is true that the orchestra is perhaps not fully up to the delicate tuning required by the very, very quiet chords. Too much to expect live, I suppose. The finale again almost succeeds, fragmentary, uncomfortable but not really mysterious. The half-remembered dreams around the 15-16 minute mark are nearly successful, but not quite. There is much to admire here, to be fair, and Arts� labelling of the recording as �audiophile� is to be taken seriously, but the live provenance means there are too many little slips to enable these performances to be ones to live with.